It is only the beginning of the month and I have already received my Topbox. It’s usually not this early, but receiving it this quick is quite a treat. 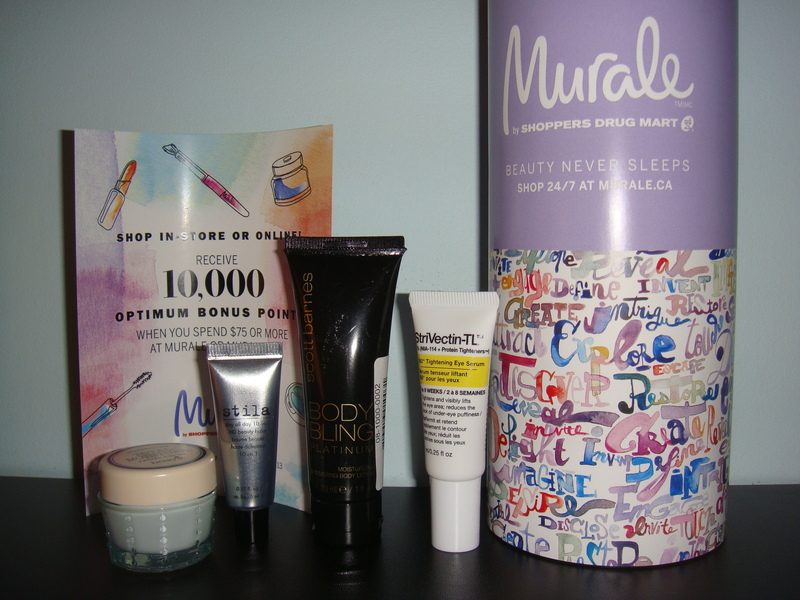 This month’s products came in a Murale by Shoppers Drug Mart covered box. – I am pleased that a Benefit product was included in this month’s box as I do enjoy their products. Their packaging is cute, but not sanitary! This cream comes in a small jar, but it is not ideal sanitary wise when you dig your fingers in and bacteria can easily get inside. I wish it was packaged with maybe a pump or squeeze tube. The cream has a thick consistency and a fragrance to it that is not too overbearing once absorbed into your skin. – I have no idea why this would be included in a fall season beauty box. I can see this being used in the summer when you are nice and tanned and want to add extra shimmer to your body, but it is not really ideal for the fall/winter time when you are layered in clothes for the colder temperatures. – Once I saw this inside, I knew that I have previously received this before in my June 2012 Topbox. I tried it and did not really like it as I found that it did not do anything for skin so I will have to give this away. I am also hoping that Topbox can do something about this repeat product! – This eye serum is supposed to tighten, lift and firm and reduce under eye puffiness in 2-8 weeks. I am eager to see if this will really do all that it claims! It has a clear, gel like texture with a slight flowery scent to it and immediately absorbs into the skin. 2 out of 4. I will be using the Benefit and StriVectin products, but the other two are of no use to me. Last month’s box was good! This month’s fell short. I have seen others receive a Bioderma Sensibio in their boxes this month and I am envy of that! I wished I received it as I really do want to try Bioderma out after getting recommendations to try it when I blogged about the Reversa Micellar Solution. Also included was a coupon to receive 10, 000 Optimum bonus points if you spend $75 or more in stores or online at Murale. What did you receive in your October Topbox?